Our recollections of the Old Baraboo Race course take us back many years, away back to the sixties, probably some fifty-six, or maybe fifty-seven years ago. Some few of the older citizens can remember it, but the main part of the present generation have probably never even heard of it, although at the time it was a very important asset to the village. I was one of a bunch of small boys of the neighborhood and we watched the details of its construction, and the various events that took place there, with the keenest interest. In fact we were right on the job early and late, and there was very little that got by us. It was just on the even of the base ball era, and at the time horse racing seemed to be the most popular public amusement that we had. It is true that there were other amusements, such as skating and dancing, but these seemed to attract mainly just the younger element, while the horse race seemed to catch all classes. The old and the young, the well-to-do and the poor, the good and the bad, all mingled and jostled their way together in a rather rough but good natured crowd and all for the time being at least were on a common level. Up to this time, horse racing in the vicinity of Baraboo had been carried on in a rather desultory manner. It sometimes took place in some farmer’s meadow, or may be on some fine stretch of country highway, and on special occasions the village streets were sometimes used for this purpose, and even the frozen surface of Devils lake has been the scene of some fiercely contested races. With a view of providing a suitable track for horse racing, and also putting the amusement in such shape that it would at least finance itself, an association of some of the local horse-men was organized. The main spoke in the wheel was Captain Ellsworth, and associated with him were Steve Emery and his son Frank Emery. There were probably others interested but if so they did not take a very active part in the affairs. Ellsworth was a man possessed of unusual fine personal appearance, well above the average in size, straight as an arrow, and he wore a long full glassy black beard, quite common in those days. A man of but few words, but of considerable action and determination, and if given the opportunity, he no doubt would have made an ideal military leader. His whole general appearance was one that commanded respect. A tract of land in the east part of town was selected and was based for a term of years of the Peck estate. This tract was a part of the original Even Peck homestead of 160 acres and described as the southwest quarter of section 36, town 12, range 6 east. At that time this tract was wild land, covered for the most part with underbrush and small timber, with some few scattering large trees. It also included a small pond, where water stood the year ‘round. This tract, roughly speaking, included what is now the four blocks lying between Elizabeth and Camp streets, and Fourth and Eighth streets. It also included all of Elizabeth street and probably part or all of Camp street lying between Fourth and Eighth streets. On this tract was laid out and graded a half mile oval race course, and this was all inclosed with a high board fence, the whole arrangement being similar to the one at the present fair grounds. The main entrance, and the only for that matter was located exactly at what is now the intersection of Fifth street with Elizabeth street, and the judges’ stand was located about where the Williams Grocery store is now situated. The vicinity of these four corners saw many dollars change hands in those old days, not from the gate receipts alone, but mostly the money lost and won on the races. During the process of grading the track an accident occurred that just barely missed ending in a tragedy. Mr. Emery had built a huge wooden roller especially for this job and was using it to smooth and pack down the road-bed. The roller was provided with an ordinary wagon tongue which was attached to a large beam that ran the whole length of the roller and just in front of it, and to this beam the horses also were attached. The boys of the neighborhood, like all other boys, were not long in discovering that on this beam was an ideal place to take a ride and as Mr. Emery was sort of friendly to them and had not objected to it, some of the older ones were availing themselves of this opportunity. On this particular occasion there were three of them riding the roller. Fred Wallace, Walter Richards, and Pat Megan. All was going nicely and the boys were having a fine time, when all of a sudden the scene was changed by the roller striking an unseen obstacle, and the shock threw the boys off the beam and under the heels of the horses. The scene that followed was surely a fierce one, and one I shall never forget. The horses, apparently full of life, became frightened and seemed to be panic stricken. They began to plunge and kick in a most vicious manner, while the boys, pinned amid the flying heels, and clouds of dust seemed entirely helpless, and unable to get themselves out of the trap. Placed in the trying position that he was, Mr. Emery showed wonderful nerve and coolness in handling the horses. If he had allowed them to go ahead but a few feet the boys would have been crushed under the roller, while if they backed up the same distance the boys would have been trampled under foot; but he managed somehow to hold them right there. Fortunately there were several other men working nearby and they hurried to their assistance. While some helped him to hold the horses, the others at the risk of their lives reached in behind the horses and by getting hold of a leg or an arm they finally succeeded in pulling the boys out to safety. The whole affair was probably all over in less than two minutes, although it seemed a much longer time. Megan was the only one able to get home without assistance, as the other two had to be carried. Wallace fared the worst of all, as it was soon discovered that he had a broken leg, as well as some other injuries. As our home, which was about opposite the present Second ward school house, was at that time the nearest dwelling, Wallace was taken there and soon good old Dr. Hall arrived with a supply of splints and soon had the leg bandaged up. Fred was then transferred to his home, which was at the old Western hotel, that his father, William Wallace, operated at that time. Richard still survives and I understand lives somewhere in the state of Washington, but Wallace and Megan have passed to the beyond. It is probably superfluous to add that this ended the riding with Mr. Megan on the big roller. The men who followed the races at the Baraboo track habitually, either as horse owners, drivers, or attendants, were probably the most popular class of men in the community. Everybody knew them personally, and everyone by their importance. To us small boys especially, their importance was marvelous, and our admiration for them knew no limits. In our comparison to them, all the leaders of the late Civil War would have attracted no more of our attention than that yellow complexioned dog said to be owned by Mr. Finnegan. From among this group of local horsemen, I can recall the names of Charlie Davis, Fred Crouch, the Udell brothers, Joe and George. Frank Ames, Frank Emery, and the colored man, Felix, was right there to receive a full share of the honor and glory, as well as the applause from the Grand Stand. There were a number of others, but I can not recall their names. Most of them have disappeared, or have passed to the beyond, but I understand that Frank Ames is still living in the vicinity of La Valle. We would be glad to hear form him, or any of the others who may still survive, as they no doubt could add much to these statements. These men thoroughly understood horse nature, and how to handle and take care of them, and apparently they thought as much of a horse as they did of themselves. While at times they would seemingly crowd a horse to the limit of his speed, still they were careful not to abuse one. We still have a very few of the same type of men with us today. They were just such men as Jasper Ewing, Arthur Wilkinson, and possibly two or three others in this vicinity. Probably the most conspicuous character at the old time races was William (Bill) Wells. Mr. Wells at that time was a man of middle age, about average size and he was possessed of a luxuriant flowing black beard. He was supposed to operate a farm in the vicinity of Okee and Lodi, but the truth of the matter was that he put the most of his time and resources into the breeding, raising, and training of race horses, both trotting and running, and he always maintained quite a herd in both classes. I don’t remember of his ever riding a running horse, as this was usually turned over to light weight men or boys; but he usually drove his own trotting horse, and although it was many years ago, I can still see him coming down the course seemingly at break neck speed, in one of those old style high wheel sulkies, his long black beard parted by the wind and streaming out behind him. Wells always provided each of his horses with a dark Indian-red blanket, with the name of the horse appearing on both sides, worked in with letters of a contrasting color. The names of the horses were some times suggestive, but more often just fantastic. I can recall but a few of them. There was Big Injun, Icicle, Old Harry, and Red Rover; and when the horses with their showy blankets on were paraded up and down the track, it added much to the attractiveness of the scene. The scenes at those old time races were in a class all by themselves. The talk was generally boisterous, boastful and often accompanied by profanity, yet nobody ever took any offense at it, but seemed to accept it as part of the game. Public betting on the result of the races was one of the main features, and it was a common scene to see men mingling in the crowd, shaking a fist full of bills in their forces, and offering bets of all the way from even money to odds of ten to one on their favorite horse. With all this noise and confusion, everybody seemed to keep good natured, and I do not remember of ever having seen any fighting taking place on these occasions, although fighting was much more common in those days, than it is now. It may be as President Wilson once expressed it, "We have grown too proud to fight." One feature about these races that always impressed me as being quite remarkably was, that although many of the horses were very similar in size and color, still the main part of the crowd seemed to be readily able to identify the individual horses, just the same as they recognize different persons by their faces. This I was never able to acquire to any extent, as most of them looked very much alike to me. The life of the old race course however, was much like that said of a strawberry plant: "It was a short and a merry one." 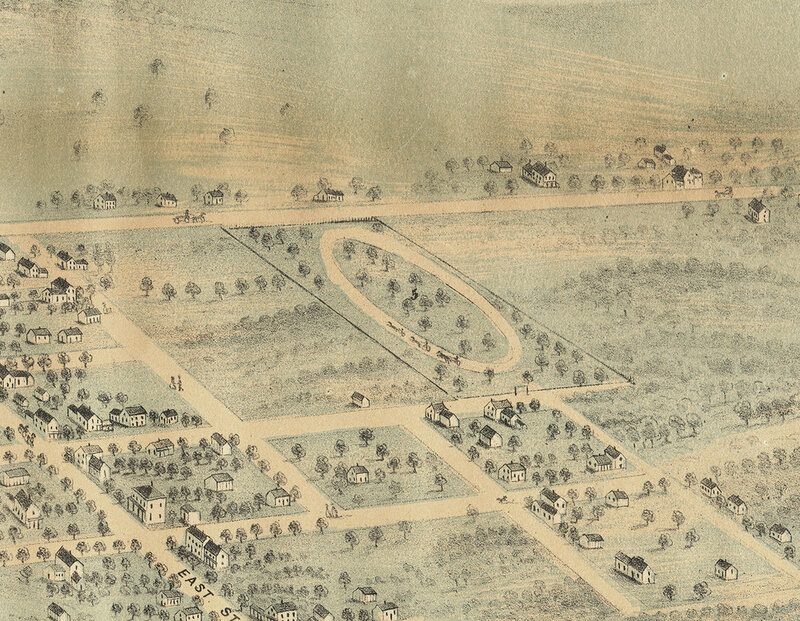 It had been in existence but a few years when the Sauk County Agricultural society established their fair grounds at the present location, and this was also provided with a race track, so the old track was dismantled and abandoned about 1870. While it is a fact that we yet have horse-racing, still there seems to be something lacking, even considerable. Just what it is seems difficult to describe. The horses of to-day are no doubt as fast as the old timers, (and althought I am reluctant to admit it) the drivers are probably just as skillful and nervy as they used to be. The trouble probably lies mostly in the spectators themselves. They watch a race in a disinterested sort of way, and there is very little demonstration or enthusiasiam about the whole affair. There are probably other things that are of more interest to the, or it maybe that the ban on public betting has taken some of the fascination out of the game. Whatever may be the cause, the fact remains that the horse race of to-day is not what it used to be. The public sports of to-day are somewhat more varied, and are no doubt on a much higher plane than was the old time horse race with all of its attending features, still it is with pathetic thoughts that we turn away from those old time scenes, knowing that they have passed, never to return.